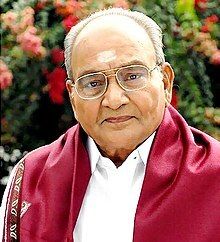 Kasinadhuni Viswanath (born 19 February 1930; better known as K. Viswanath) is an Indian audiographer turned director, screenwriter and character actor known for his works in Telugu, Tamil, and Hindi cinema. He is a recipient of five National Film Awards, six state Nandi Awards, ten Filmfare Awards South, and a Bollywood Filmfare Award. In a film career spanning sixty years, Viswanath has directed fifty three feature films in a variety of genres, including films based on performing arts, visual arts, and aesthetics. Viswanath has received international recognition for his works, and is known for blending parallel cinema with mainstream commercial cinema. Viswanath was honored with the "Prize of the Public" at the "Besancon Film Festival of France" in the year 1981. His directorial works which are produced by Poornodaya Movie Creations were screened to special mention at the Moscow International Film Festival; such films were dubbed into Russian language and have been theatrically released in Moscow. In 1992, he received the Andhra Pradesh state Raghupathi Venkaiah Award, and the civilian honor Padma Shri for his contribution to the field of arts. He was awarded the 2017 Dadasaheb Phalke Award, the highest award in Indian cinema, at the 64th National Film Awards. Kasinadhuni Viswanath was born on 19 Feb 1930 in a Telugu speaking Brahmin family to Kasinadhuni Subramaniam and Kasinadhuni Saraswati (Saraswatamma). His ancestral roots come from Pedapulivarru, Andhra Pradesh, a small village on the banks of River Krishna. Kasinadhuni is his family name, Viswanath is his given name. Viswanath studied Intermediate from Guntur Hindu College, and holds a B.Sc degree from Andhra Christian College of Acharya Nagarjuna University. He began his career as a sound recordist at Vauhini Studios in Madras, where his father was an associate. Kasinathuni transitioned into film direction at Annapurna Pictures under Adurthi Subba Rao and K. Ramnoth. He wished to work as an assistant to director K. Balachander and Bapu. During his early career, Viswanath was associated with Adurthi Subba Rao on National Award winning films such as Mooga Manasulu (1964) and Doctor Chakravarthy (1964). Viswanath scripted Sudigundalu (1968), and directed works such as Aatma Gowravam (1965), O Seeta Katha (1974) and Jeevana Jyothi (1975) which garnered the state Nandi Awards, and were screened at the Asian and African film Festival at Tashkent. Viswanath's classic blockbusters Sankarabharanam (1979) and Sagara Sangamam (1983) were included among CNN-IBN's list of one hundred greatest Indian films of all time. His directorial works Sankarabharanam and Saptapadi have garnered the National Film Award for Best Popular Film Providing Wholesome Entertainment and Best Feature Film on National Integration, respectively. Sankarabharanam, was premiered at the 8th International Film Festival of India, the Tashkent Film Festival, and the Moscow International Film Festival held in May 1980. Viswanath also won the Prize of the Public at the Besancon Film Festival of France in the year 1981. Viswanath's Swati Mutyam was India's official entry to the 59th Academy Awards. Swati Mutyam, Sagara Sangamam and Sirivennela were premiered at the Asia Pacific Film Festival. Swayam Krushi was premiered to special mention at the Moscow International Film Festival. Sankarabharanam, Sagara Sangamam, Shrutilayalu, Swarnakamalam and Swati Kiranam were screened in the Indian Panorama section at International Film Festival of India,, Ann Arbor Film Festival, and AISFM Film Festival. In 1965, Viswanath debuted as a director with Telugu film Aatma Gowravam, which won the Nandi Award for Best Feature Film of the year. Viswanath followed it up with drama films Chelleli Kapuram, Sarada, O Seeta Katha and Jeevana Jyoti, which are women-centric films. It was in Siri Siri Muvva that the artistic touch in his craft first became visible. Sankarabharanam highlights the neglect of traditional Indian music under the increasing influence of western music. The film brings out the grandeur of Carnatic music, the traditional South Indian music towards the end. Bhaskaran, a media and film researcher from Chennai has documented, in his study of South Indian music culture, how Sankarabharanam contributed to the revival of Carnatic music in a big way. The film broke many commercial records by running for over one year in cinemas. In a recent study published in Journal of Dance, Movements & Spiritualities published by "Intellect Group" of the United Kingdom, C. S. H. N. Murthy, a media and film studies scholar from India, has demonstrated how Viswanath's filmography embraces a wide spectrum of characters that include mentally and physically challenged subjects as well, like the film Sarada, which exploits a psychologically deranged woman, Swati Mutyam, which exploits an autistic man's humanism, Sirivennela which revels in situations between deaf and dumb characters, and Kalam Marindi, which dwells on characters stuck in a caste based society. Viswanath's filmography is known for addressing the issues of caste, color, disability, alcoholism and socio-economic differences through liberal arts in works such as Saptapadi, Sirivennela, Swayamkrushi, Shrutilayalu and Swarnakamalam. The researcher, C. S. H. N. Murthy observed that Viswanath's films offer a pathway towards inclusiveness, affecting positive spiritual change at both personal and social levels. Situating the content in the broad arena of de-westernizing media studies, through immersive and culturally embedded perspectives, Murthy endeavoured to offer modern and postmodern dimensions in Viswanath's films. Viswanath has made many films dealing with a wide range of human and social issues: Saptapadi, Sirivennela, Sutradharulu, Subhalekha, Shrutilayalu, Subhasankalpam, Aapadbandhavudu, Swayam krushi, and Swarnakamalam have lead characters representing different strata of society, meticulously etched to suit the larger picture. In Saptapadi, he decries the evils of untouchability and the caste system. In Subhodayam and Swayam Krushi he emphasizes the dignity and respectability of manual labor. In Subhalekha, he deals, in a humorous way, with the dowry system - one of the major evils in today's society. While Sutradharulu urges present-day society to recognize the need to adopt the ideals of non-violence, Swati Kiranam depicts the harm that can be caused by the basic instincts of envy and anger in a man, however accomplished he may be. In spite of the nature of these subjects, they are presented in a subtle manner with an imaginative story line, with just the right amount of emphasis on the intended message. Yet Viswanath's films were never offbeat cinema, but wholesome entertainers those elevated the lead actors' image. He is a director with social-conscious mind and who believes cinema can bring out desirable changes in society if presented in a format liked by a cross section of audience. Edida Nageswara Rao founded "Poornodaya Movie Creations", which encouraged Viswanath to make aesthetic films. Poornodaya has produced several of Viswanath's films like Sankarabharanam, Swatimutyam, Saagarasangamam, Sutradharulu, and Aapadbandhavudu. Most of these films were dubbed into Russian and were screened at the Moscow Film Festival. Viswanath has also directed Hindi language films such as Sargam (1979), Kaamchor (1982), Shubh Kaamna (1983), Jaag Utha Insan (1984), Sur Sangam (1985), Sanjog (1985), Eeshwar (1989), Sangeet (1992) and Dhanwaan (1993). Some of these films (especially his collaboration with actress Jayaprada) have been super hits at the box office. In 1995, Viswanath debuted as an actor with Telugu film Subha Sankalpam. As a character actor, he has appeared in works such as Vajram (1995), Kalisundam Raa (2000), Narasimha Naidu (2001), Nuvvu Leka Nenu Lenu (2002), Santosham (2002), Seema Simham (2002), Tagore (2003), Lakshmi Narasimha (2004), Swarabhishekam (2004), Aadavari Matalaku Arthale Verule (2007), Athadu (2005), and Pandurangadu (2008), and Devasthanam (2012). He essayed characters in Tamil works such as Kuruthipunal (1995), Mugavaree (1999), Kakkai Siraginilae (2000), Bagavathi (2002), Pudhiya Geethai (2003), Yaaradi Nee Mohini (2008), Rajapattai (2011), Lingaa (2014) and Uttama Villain (2015). Viswanath had also acted on a few television serials; Siva Narayna Teertha on SVBC TV, Chellamey on Sun TV, and Suryavamsam on Vendhar TV. He also endorses brands such as GRT Jewellers and appears in various television commercials. Viswanath is married to Kasinadhuni Jayalakshmi and they have three children: Padmavati, Nagendranath and Ravindranath and six grandchildren- Hema, Swarna, Naren, Pranav, Sivani and Gayatri. Actor Chandra Mohan and singer S. P. Balasubrahmanyam are Viswanath's cousins. Receiving Dadasaheb Phalke award from president Shri Pranab Mukherjee in 2017. 2014 - Gulf Andhra Award for Life Time Achievement in Cinema - U.A.E. 2017 - Dadasaheb Phalke Award for life time achievement in cinema. 2012 - Viswa Vikhyata Darsaka Sarvabhowma for achievement in direction. 2012 - Chittor V. Nagaiah Puraskaram for life time achievement in cinema. 2017 - Film Nagar Cultural Center - Hyderabad Award for achievement in cinema. 2017 - Telugu Film Director's Association Award for achievement in direction. 2017 - Aathmeeya Sanmanam from Government of Andhra Pradesh for achievement in cinema at Vijayawada Thummalapalli Kalakshetram. ^ a b c d e f g h i j k "Dance, Movement & Spiritualities". Intellect Ltd.
^ a b c d e f g h i j k Murthy, C. S. H. N. (1 December 2014). "Inclusiveness through art films in Telugu: A modern to postmodern analysis of K. Viswanath's films". Dance, Movement & Spiritualities. 1 (3): 413–438. doi:10.1386/dmas.1.3.413_1 – via IngentaConnect. ^ a b "52nd National Film Awards" (PDF). Directorate of Film Festivals. Akal Information Systems Ltd. p. 81. Retrieved 20 January 2012. ^ a b c d "Arts / History & Culture : Celebrating a doyen". The Hindu. 26 April 2012. Retrieved 5 September 2012. ^ a b Special Correspondent (20 February 2012). "NATIONAL / ANDHRA PRADESH : Director K. Viswanath to be feted". The Hindu. Retrieved 5 September 2012. ^ a b "29th National Film Awards" (PDF). Directorate of Film Festival. Retrieved 1 January 2013. ^ a b "Poornodaya movies in Russian language". mirchi9.com. ^ Ranjana Dave (30 June 2011). "The meaning in movement". The Asian Age. Archived from the original on 6 April 2012. Retrieved 4 September 2012. ^ a b c d e f g h i j k l m n o p "Director K Viswanath named for Dadasaheb Phalke award". Deccan Chronicle. 24 April 2017. ^ "Difficult to Produce Another Talent Like K Viswanath: Kamal Haasan". 25 April 2017. ^ Andhra Pradesh / Guntur News : Society needs good films, says K. Viswanath. The Hindu (25 July 2010). Retrieved on 2013-07-28. ^ Entertainment Hyderabad / Events : Viswanath felicitated. The Hindu (22 July 2005). Retrieved on 2013-07-28. ^ a b "Reporter's Diary". The Hindu. 19 September 2006. ^ rediff.com, Movies: Interview with K Viswanath. Rediff.com (3 May 2000). Retrieved on 2013-07-28. ^ "Stamp in honour of director L.V. Prasad". The Hindu. 1 September 2006. ^ 100 Years of Indian Cinema: The 100 greatest Indian films of all time|Movies News Photos-IBNLive. Ibnlive.in.com (17 April 2013). Retrieved on 2013-07-28. ^ "Directorate of Film Festival" (PDF). Iffi.nic.in. Retrieved 1 January 2013. ^ Prakash KL. "Sagara Sangamam to be screened at Kamal's films fest | - Oneindia Entertainment". Entertainment.oneindia.in. Retrieved 4 September 2012. ^ "Chiranjeevi felicitation on Padma Bhushan honor - Telugu Cinema actor". ^ "Directorate of Film Festival" (PDF). Iffi.nic.in. Retrieved 4 September 2012. ^ 300 films during 11 days from 47 countries in IFFI-2009. Literature India. Retrieved on 28 July 2013. ^ "Dance without frontiers: K Viswanath – Director who aims to revive classical arts". 2 May 2017. ^ "The films of K. Viswanath". 15 February 2014. ^ a b "Chiranjeevi felicitation on Padma Bhushan honor – Telugu Cinema actor". Idlebrain.com. 19 April 2006. Retrieved 4 September 2012. ^ a b 30 Jun 2011 – Ranjana Dave (30 June 2011). "The meaning in movement". The Asian Age. Archived from the original on 6 April 2012. Retrieved 4 September 2012. ^ "Chit chat with Edida Nageswararao Parts(3)". mirchi9.com. ^ "K Viswanath to direct Hrithik". The Times Of India. 12 September 2003. ^ Dream Merchants Ad Film Production House (12 January 2013). "Telugu Ads GRT Jewellers" – via YouTube. ^ "Viswanath vows to continue his mission". The Hindu. 17 April 2010. ^ "'K Viswanath brought dignity and grace to Telugu cinema'". ^ "With Cheekati Raajyam, Kamal returns to Telugu". ^ a b Roshan, Sunaina (5 July 2017). "To Dad with Love". Om Books International – via Google Books. ^ "Padma Awards". Ministry of Home Affairs, Government of India. 2015. Archived from the original (PDF) on 15 November 2014. Retrieved 21 July 2015. ^ a b "Directorate of Film Festival" (PDF). Iffi.nic.in. Retrieved 4 September 2012. ^ "K Viswanath to be honored at GAMA Awards - Times of India". ^ "Dadasaheb Phalke Award goes to legendary filmmaker Kasinathuni Viswanath". ^ DD News (3 May 2017). "64th National Film Awards: K. Viswanath receives Dadasaheb Phalke award" – via YouTube. ^ "Cinemaa awards 2008 presentation - Telugu cinema". ^ "35th Annual Filmfare Awards South Winners : Santosh : Free Download &..." 5 February 2017. ^ http://english.tupaki.com. "FNCC Team Felicitates K Viswanath and SP Balu Photos - Photogallery - Page 20". tupaki. ^ "Telugu Film Director's Association felicitates K Viswanath for Winning Dada Saheb Phalke Award - Telugu cinema". www.idlebrain.com. ^ "I want to remain humble, says ace director K. Viswanath".